me and him: happy halloween! 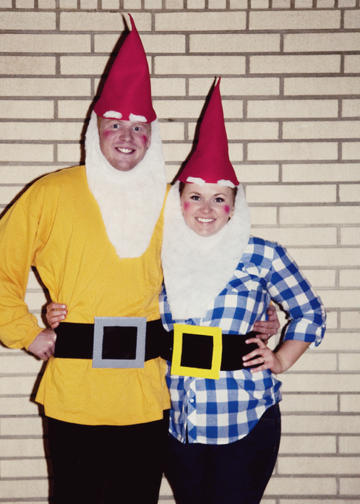 we were garden gnomes—what were you? Halloween is definitely not my fave. the classic wimpy friend who even gets scared T.P.ing houses. count creepy masks. hate those) and pumpkin patches. 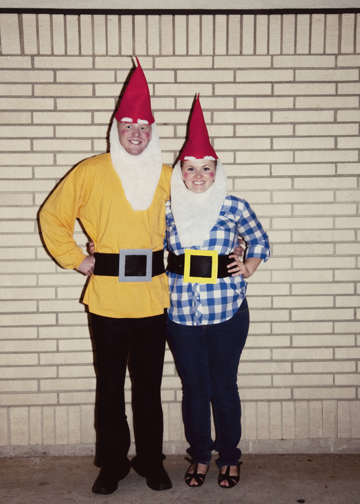 turned into the best two lawn gnomes you ever did see. I think I'm coming around on this Halloween thing. about all things holidays I'm pretty sure I'll be good to go! pumpkins—ther than that, good to go! I'm going to ruin Halloween for the children aren't I. Sweet! You guys pulled it off nicely! My first time to see someone dressed up as a lawn gnome. Impressive...even though I've never actually purchased one...nor plan to. You will love Halloween and spiders on Halloween someday! Creative costumes. I like it. What made you think of being a gnome? You two are the CUTEST little pair I've ever seen! BEST costume I've seen YET!! awwww cute costumes, cute couple, everything thing about your blog makes me smile... it is just all SO CUTE!!!!! I love the costumes, you need to make sure to save them... my buddy dressed her 10 month old as a gnome too... so when you guys have a little one you could be a family of gnomes!! I've got to admit, I'm not a big fan of Halloween either, but you two would win my costume contest every time!